As a mom, I am always seeking reliable information and reassurance that I am doing things the “right way”. However, I do have a vivid imagination and I am not the type of person who benefits from what I think of as the “age of too much information”. 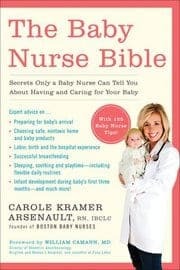 This is why I really enjoyed The Baby Nurse Bible by Carole Kramer Arsenault, RN. This book is packed with all of the information expectant moms need to get them through pregnancy and the first three months of their baby’s life but it is presented in an approachable and conversational format that I think puts our minds at ease. My son is already almost 5 months old (wow), but looking back on my pregnancy and those first few months, I wish I had had this book. I love the way it’s organized into four main sections titled “Getting Ready,” “Labor, Delivery and the Postpartum Period,” “Breastfeeding Your Baby,” and “The Fourth Trimester”. These main sections are further separated into smaller sections that address all of the concerns we face in those months leading up to the birth through to the third month of life. This organization makes it easy to find and read the section that addresses your particular concerns. Time is such a precious commodity as you begin the journey through motherhood and I feel this book is a quick and easy read. I like how in each of the sections the format is question and answer style and also includes quick lists and diagrams to lead moms through the most critical basics of baby care, baby safety, and more. These represent the most asked questions that Arsenault has received throughout her career as a labor and delivery nurse. I also like that there are 125 “Baby Nurse Tips” throughout the book. These are quick reads that you can skim through as you have the time and energy! The topics take you through preparing for baby’s arrival, choosing the safest products for your baby, successful breastfeeding, soothing your baby and helping him sleep, infant development and much more! Having already been through the process, I can say with confidence that reading this book will really prepare you for the things you will experience. The information about the labor, birth and hospital experience gives a great overview of all the things you may go through. I personally agree with Arsenault’s views on different topics and find that she isn’t too extreme in any of her recommendations. For example, I really appreciate the fact that she isn’t critical of moms who choose not to breastfeed. I was fortunate enough to be able to and I am having an extremely positive experience with it, but prior to having my son I didn’t know how it would go and was afraid to be judged negatively by health professionals if I did not succeed. I think it is wonderful that Arsenault encourages breast feeding but acknowledges that it is a personal choice and that some moms are unable to do it. I like that she acknowledges there are many ways to do things and still be a good mom. The final chapter is entitled “From Newborn to Toddler: Bring on the Milestones” and I love how it provides a condensed, yet detailed overview of the eating, sleeping, and development milestones you will notice throughout the remaining months of baby’s first year. There are also some great suggestions of activities you can try with your baby during these months. I think it would be great if she wrote a second book going into more detail about the toddler years! This is an awesome pregnancy,birth and baby book. It’s like getting three books in one. I loved it- all of my questions and more were answered in this book. I love how the author is an actual RN and works with new parents daily. I felt like the information in this book is exactly what I need to hear without making me feel anxious. There are other pregnancy books on the market and this book is by far the most informative one that I have read. I will bring this book to the hospital with me next month when my baby is born.